Cooktown Holiday Park is just a short stroll into town and is set amongst 8 acres of award-winning tropical gardens and beautiful surroundings. We have a variety of accommodation ranging from comfortable, fully self-contained 1 and 2 bedroom cabins, budget cabins, motel style units, and roomy caravan and camping sites that can accommodate large motorhomes. All our sites are powered. 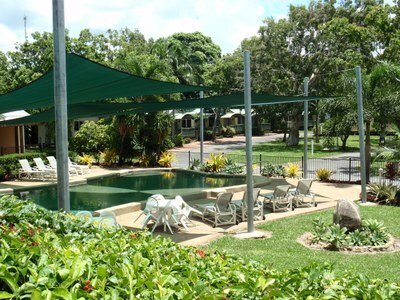 Modern amenities, a large shaded swimming pool and a well set out camp kitchen which has been voted by our guests as one of the best Australia has to offer. Wake up to sounds of the many birds that frequent the Park.